Corrosion of water pipes has many causes, and not all are well understood. Corrosion causes leaks and also affects the quality of drinking water. 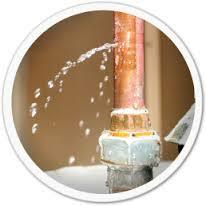 Here are a few of the main reasons why water pipes corrode. Some are simple and easy to remedy; others are complex and hard to diagnose. Often, more than one of the following contributes to the breakdown of pipes. Galvanic. Galvanic corrosion is common with metal pipes. It occurs when pipes made of different metals are joined. A small electrical current flows from one to the other. 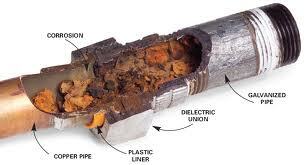 Galvanic corrosion is easily prevented by installing a dielectric union when joining the pipes, but in the effort to save money, dielectric connectors are often left out. Dissolved Gases and Chemicals. High levels of dissolved gases, like oxygen or carbon dioxide, can corrode metals pipes and cause pinhole leaks. High levels of chlorine can be corrosive to pipe, and high levels of fluoride corrodes stainless steel. Chloramine is associated with the leaching of lead from inner pipe surfaces. Low pH. Water with low pH attacks copper pipes and causes pinhole leaks. Copper is subject to corrosion when the water is below 7.0 pH. This is usually not a problem with city water, but it can be a significant issue for well owners. Low alkalinity. Alkalinity is related to pH, but it isn’t the same. Low alkalinity leaves pipes vulnerable to acids. Low TDS (Total Dissolved Solids). Nature hates a vacuum. Water that has a low dissolved mineral content can pull minerals from metal pipes. High Temperature and High Flow Rates. Hot water is much more corrosive than cold. The faster water flows through a pipe, the more it breaks down the pipe. Microbiological. Microbes, if given a food supply and oxygen, can corrode pipes causing interior buildup and subsequent leaks. Corrosion in a water distribution system can cause health issues as well as damaging water leaks. When pipes are corroded, some of the metal from the pipe enters the drinking water and is consumed. Pipes and fixtures containing copper, lead, and brass (brass contains lead) can cause a variety of health problems. While the municipal supplier regulates such contaminants as lead at the water plant, no one is checking the actual amount of lead or copper that comes out of the kitchen tap. Pipe corrosion is a compelling justification for having a drinking water system under the kitchen sink. A comprehensive treatment system like reverse osmosis takes care of virtually any contamination that enters the water on its way from the water plant. People often purchase a water filter when a plumber shows them the inside of a pipe during a plumbing repair. The pristine water described in the city’s annual water report has to come through miles of dirty pipes before it gets to your drinking glass.